Michelle MacLaren to direct Chris Pratt in COWBOY NINJA VIKING, film due June 28, 2019! 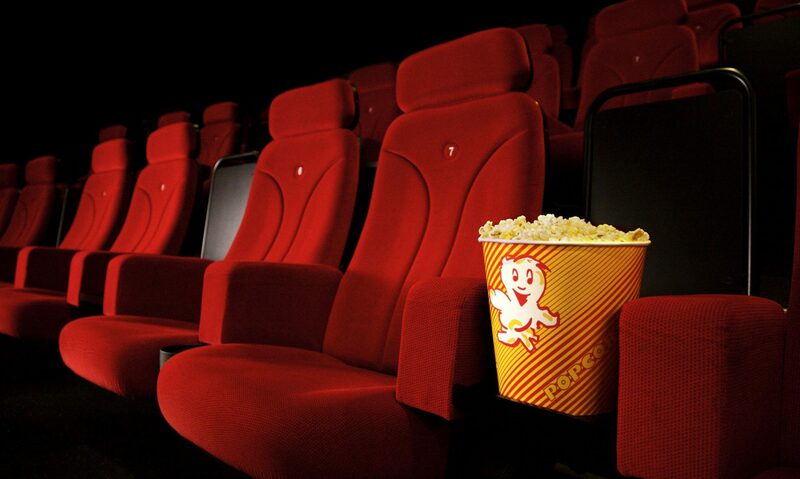 A long-gestating project has landed a highly anticipated director. An adaptation of the Image Comics graphic novel COWBOY NINJA VIKING was announced years ago at Universal Pictures, after which Chris Pratt signed on to star and produce. But the project has been gestating for some time while Pratt honed his franchise skills in films like JURASSIC WORLD and the GUARDIANS OF THE GALAXY/Marvel movies. Now, however, it appears COWBOY NINJA VIKING may finally be moving forward—with Michelle MacLaren directing. The critically acclaimed director of some of the best episodes of ‘Breaking Bad’, as well as installments of ‘Game of Thrones’, ‘Westworld’, and ‘The Walking Dead’, had initially been poised to make her feature directing debut on Warner Bros.’ WONDER WOMAN. But after a few months on the DCEU project, MacLaren departed over creative differences—there were rumors that she wanted the film to be set in a far earlier time period than World War I, but it’s officially unclear as to exactly why MacLaren left the project. Patty Jenkins came onboard thereafter and the rest is history, but it’s exciting to see that MacLaren will now finally be making the leap to the big screen as Variety reports she’s onboard to helm COWBOY NINJA VIKING. There was no doubt MacLaren would find a big project after leaving WONDER WOMAN, but it was a question of what and when. Immediately after departing the superhero pic she signed on to executive produce and direct the pilot and Season 1 finale of the HBO series ‘The Deuce’, but with Season 1 of that show now complete it sounds like MacLaren is ready to make a movie. COWBOY NINJA VIKING revolves around an assassin who possesses the skills of the three titular personas, and it’ll be interesting to see what kind of tone this thing strikes. The script originated with ZOMBIELAND and DEADPOOL screenwriters Paul Wernick and Rhett Reese, and the most recent draft was penned by IDENTITY THIEF and THE HANGOVER PART III screenwriter Craig Mazin. So it sounds like comedy will be a big part of the film. Universal has set a June 28, 2019 release date for the film, and with Pratt’s duties in AVENGERS 4 complete it very much sounds like COWBOY NINJA VIKING will go in front of cameras sometime later this year. Not since Paul Verhoeven‘s STARSHIP TROOPERS has a film franchise satirically celebrated American jingoism as successfully as THE PURGE. The Blumhouse Production is, perhaps, even more successful than its spiritual predecessor in tapping into contemporary culture, blending the fictional with the real in ways that are increasingly blurry and disturbing. THE FIRST PURGE, the latest installment and a prequel film, pulls no punches in directly connecting its marketing message to Donald Trump and his signature American-made hats. The first trailer for the film is available now, after its poster unveiling just yesterday, but don’t expect too much in the way of plot or even cast/character reveals. It’s essentially a piece of propaganda meant to whip red-blooded Americans into a frenzy in anticipation of the Purge, and more specifically, to boost the pride that parents should feel when their children want to join in on the event. It’s effective, for sure, but one wonders how soon THE PURGE will cross from fiction into full-blown reality, a concern we never really had for STARSHIP TROOPERS. That’s the scariest kind of horror film there is. Starring Y’Lan Noel, Lex Scott Davis, Joivan Wade, Luna Lauren Velez and Marisa Tomei, Gerard McMurray‘s THE FIRST PURGE opens on July 4th, of course. THE FIRST PURGE poster targets current political climate, film due July 4, 2018! Blumhouse Productions and Universal have released the title and poster for THE PURGE 4, which is called THE FIRST PURGE, and it’s just straight-up going there. If you’ll recall, the poster for THE PURGE: ELECTION YEAR boasted the tagline “Keep America Great” with some not-so-subtle nods to Donald Trump. 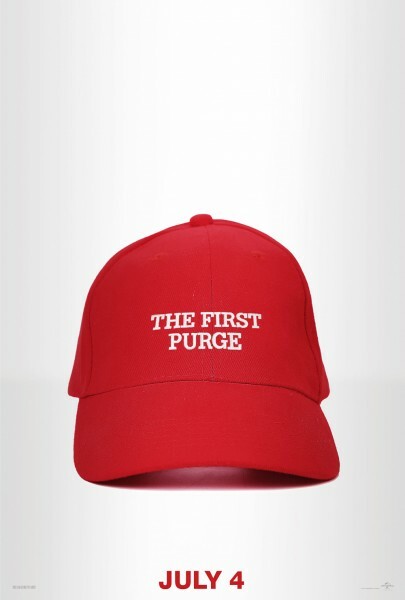 Well the first poster for THE FIRST PURGE features a “Make America Great Again” hat from Trump’s presidential campaign; only instead of that ridiculous slogan it simply boasts the title of the new movie. This is the fourth film in the popular horror franchise, which began in 2013 with filmmaker James DeMonaco’s twist on a home invasion thriller: in the world of THE PURGE, one night a year in America all crime is legal, including murder. This premise was twisted further in the next two films, but now THE FIRST PURGE serves as a prequel, showing us how this all began. Gerald McMurray, the director behind last year’s BURNING SANDS and associate producer on FRUITVALE STATION, steps into the director’s chair this time around, marking the first time DeMonaco has vacated that seat. He still wrote the script for this prequel, which boasts a fresh ensemble cast that includes Y’Lan Noel, Lex Scott Davis, Joivan Wade, Luna Lauren Velez and Marisa Tomei. With this poster hitting today, one imagines a trailer isn’t too far around the corner. THE FIRST PURGE opens in theaters on July 4th. JUNGLE CRUISE, the ride, takes guests on a journey through a variety of rain forest locales, from the Nile and Congo rivers to the Amazon and more. As I wrote back when the project was first announced, one presumes the film will be an action-adventure tale, which is seemingly Johnson’s preferred milieu, and one Blunt it certainly no stranger to either (she’ll be working on EDGE OF TOMORROW sequel LIVE DIE REPEAT AND REPEAT soon enough. Having recently visited the ride at Disneyland in Anaheim, I can safely say I did not remember the extraordinary amount of puns connected to JUNGLE CRUISE, but also, I loved it. If they’re going to keep making Disney Ride adaptations, it is too much to ask that we get a SPACE MOUNTAIN one? Trailer for Duncan Jones’ cyberpunk film MUTE arrives, streaming on Netflix February 23, 2018! At long last, Netflix has released the trailer for MUTE, the new film from MOON and SOURCE CODE filmmaker Duncan Jones. The long-developing sci-fi pic stars Alexander Skarsgard as a man unable to speak who’s searching for his missing girlfriend in future Berlin. He crosses paths with a pair of U.S. Army surgeons, played by Paul Rudd and Justin Theroux, who have an agenda all their own. Jones has been wanting to make MUTE for a very long time, and he got his shot when Netflix agreed to finance the venture. The movie was actually shot back in the fall of 2016, and Netflix has been holding on to it for quite some time. Jones moved right into MUTE after helming his first major studio foray, WARCRAFT, which disappointed at the box office but had unique vision. The cast here is terrific, and there’s a delightfully off-kilter tone that promises Mute will be unlike most other sci-fi movies around. This is not your typical BLADE RUNNER ripoff (although the visuals are heavily inspired by that Ridley Scott classic), and I can’t wait to see what the full film has in store. Moreover, Jones has said MUTE takes place in the same universe as MOON and SOURCE CODE, so I’m curious to see if any overt connections are made. Written by Jones and Michael Robert Johnson, MUTE will be available only on Netflix on February 23rd. Debut ANT-MAN AND THE WASP trailer is a big fun blast, film due July 6, 2018! Marvel Studios has released the first ANT-MAN AND THE WASP trailer, unveiling the sequel. Director Peyton Reed returns to helm this follow-up, this time directing a story he conceived from the very beginning—you’ll recall that he came on to the first ANT-MAN when director Edgar Wright departed over creative differences a few months before filming was to begin. The story of the sequel finds Scott Lang (Paul Rudd) and Hope Van Dyne (Evangeline Lilly) teaming up to enter the Quantum Realm, where they must search for the still-alive Janet Van Dyne (Michelle Pfeiffer). This trailer really doesn’t give away any of the story at all, and instead is focused on showcasing the action sequences and visuals of the film. There’s a bit of a throwback vibe to it all, but if you’re looking for a substantive peek at what to expect from the ANT-MAN sequel you may be disappointed. Still, this looks pretty fun and I love the idea of Hank and Hope forming an actual team—one wonders if Reed will strike something of a buddy comedy vibe here in contrast to the first film’s heist-centric tone. Written by Chris McKenna and Erik Sommers, Rudd, Andrew Barrer and Gabriel Ferrari, ANT-MAN AND THE WASP also stars Michael Peña, Walton Goggins, Bobby Cannavale, Judy Greer, Tip “T.I.” Harris, David Dastmalchian, Hannah John Kamen, Abby Ryder-Fortson, and Randall Park, with Michelle Pfeiffer, Laurence Fishburne, and Michael Douglas and opens in theaters on July 6th. We have an early contender for horror movie of the year! A24’s twisted horror drama HEREDITARY earned rave reviews out of Sundance earlier this month and was quickly handed a peak summer release date. Riding high on that buzz, the first trailer has already arrived and it’s easy to see why Toni Collette is earning such an outpouring of critical acclaim for her performance in the film. It’s also easy to see that this movie looks scary as heck. A24 reliably turns out some of the best movies of the year, and they’ve put a spotlight on first-rate genre filmmaking since they opened their doors, so every new horror film from the studio makes my ears perk up, but the reviews on this one have been next level. HEREDITARY marks the feature film debut of writer-director Ari Aster, and the recurring theme in the film’s Sundance reviews is how bone-chilling, pants-crapping terrifying it is. Collette stars a woman processing the recent death of her difficult mother when strange, cryptic occurrences transform their grieving process into a terrifying nightmare and reveal horrifying truths about their ancestry. HEREDITARY also stars Alex Wolff, Milly Shapiro, Ann Dowd, Gabriel Byrne and arrives in theaters on June 8, 2018.